Many of my earliest memories feature my grandfather prominantly. We used to go on excursions along St. Andrews bay when I would visit him and my grandmother in Florida. My memories are now mainly of the smell of the lawn, finding shells on the beach, a guy with a dead hammerhead shark in his truck, and grandpa taking me jigging with a cane pole. 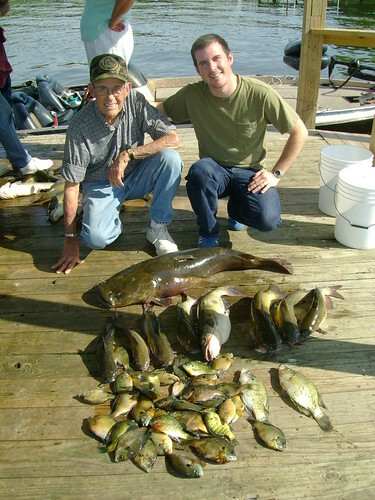 As anyone who has spent time in Florida knows, the blue gill are big! To me, when I was only 5 or 6, they seemed like Shamu. One of my earliest fishing memories is at a campground near a river somewhere in Florida. My grandfather had rigged up his trusty canepoles and Zebco, and we were pitching them into the slow water while mom boiled scallops. "Don't fish there!" Grandpa would say, as I walked over to a half submerged boat that someone had left to decay on the shore. Sure enough I wouldn't listen, and after pitching my lure into the empty boat I felt it immediatly go taut. I was rewarded for my disobediance with a fiercely fighting largemouth of a couple of pounds that had been trapped inside the boat after the water rose and then receded. Everytime we are together he retells that story. Lake Fork has some amazing Blue Gill! Not to mention the Warmouth, Red Breast, and Long ears we caught. 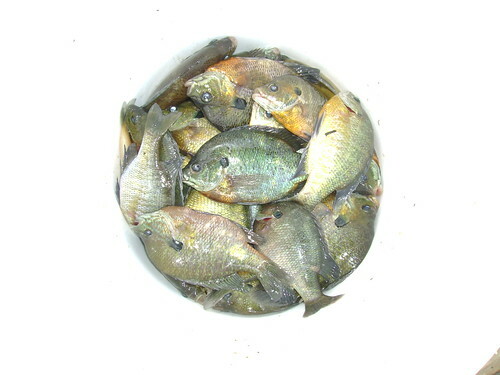 There is also a really pretty purple/blue variety of Blue Gill that I haven't seen anywhere else. I will try to get a pic of one when Emalie and I go back.